The grazing, defecating, stomping and salivating of moving herds can build soil, restore vegetation and reverse the effects of desertification, a major cause of climate change, says holistic management pioneer Allan Savory who recently ran a three-day workshop in Graaff-Reinet. Heather Dugmore was there. “A universal fear of running livestock in large numbers is the biggest cause of veld deterioration, soil erosion and desertification in the world. I said so 50 years ago, and I say it again with urgency, that hoof action, with an emphasis on large livestock hooves, is the secret to restoring degraded landscapes. They work the soil better than any machine can possibly do, and healthy soil creates healthy vegetation. Outdated notions of endlessly resting the land and decreasing animal numbers will accelerate our downfall.” Zimbabwean-born Allan Savory makes an impassioned plea for the world’s soils and grasslands. 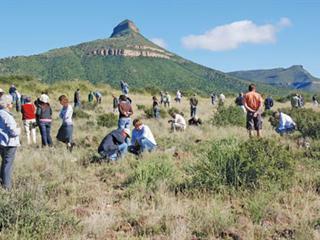 Now in his 70s, Allan is as committed to healing the veld as he was five decades ago. More than 70 farmers from throughout South Africa attended his three-day workshop in Graaff-Reinet in mid-April, and many others had to be turned away for lack of space. Finally, his message is being heard. From the United Nations to farmers all over the world, Allan’s call for a Brown Revolution, which focuses on what we are doing to the soil, is taking hold. “The soil is the greatest storage space for carbon and fresh water; greater than all the dams, lakes and rivers in the world, but we have messed it up,” Allan explains. To restore healthy soil to the seasonally humid and dry grasslands of the world requires substantial numbers of large herbivores on the land, tightly herded together, grazing, trampling, dunging and urinating on a piece of land and then moving on after a brief period, just as the great wildlife herds once did. In most parts of the world those herds are gone, and we now need to use livestock, particularly cattle, to achieve what Allan calls “herd effect, animal impact and hoof action”. Allan explains that a primary principle of holistic farming is to time the grazing and restoration periods to achieve maximum soil and plant biodiversity and vigour. Using holistic planned grazing, farmers are able to plan their grazing to mimic nature. This requires increasing camp numbers while decreasing their size, and grazing with high stocking densities for short periods of time. Alternatively, in large camps, stock can be herded during the day in tight groups to achieve the same effect. Freshly grazed vegetation is given a period of time from 30 days to nine months to recover, depending on recovery rate, the environment and the overall management plan. It has been an uphill battle for Allan to demonstrate the wisdom of what is now known as holistic farming, holistic range management or holistic veld management. Conventional agricultural thinking through the decades proposed the opposite. In South Africa, for example, the state introduced a stock reduction plan about 50 years ago on the basis that the major cause of veld deterioration and soil erosion was overstocking. The insight of men such as Allan Savory and South African vegetation specialist John Acocks, whose famous comment that the land was “understocked and overgrazed”, was ignored by the government, conventional scientists and most farmers. A few independently minded farmers who understood the wisdom of what Allan and John were saying today present their farms as proof of what can be achieved with good holistic management. 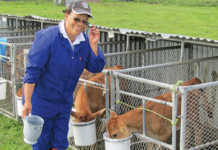 Good examples are the farms of the Jack family from Beaufort West and the Speedy family in Vryburg. Both farmers met Allan in the 1960s and have been farming holistically since then. Jennifer Speedy, who attended the workshop, farms with her father Sandy. 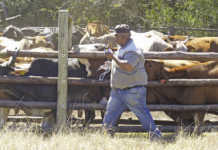 They run 1 556 Nguni cattle on their farm in 240 grazing camps of about 20ha per camp. A one-day grazing period is alternated with a recovery period of 60 or more days. “Looking back 40 to 50 years later, I am convinced we took the right road although we made many mistakes. If I could relive my life I would choose the same road,” says Sandy. “We learnt the hard way about many things such as required grazing pressure, the timing of grazing and recovery, managing the herd and the grass to ensure that stock are in the right place on the farm at the right time of the year, keeping cow-calf pairs together in a relatively densely packed herd of breeding cows calving on the move, and supplying water to a large moving herd. Tracking their course, Sandy says that they have come a long way and adds that from where he stands now the potential seems unlimited. It is this kind of testimony that debunks Allan’s detractors. “Make no mistake I have seen failures too, in stop-start operations all over the world, but when the grazing is well planned and sound holistic management is in place, it cannot fail,” stresses Allan. Based in Boulder, Colorado, in the US, the Savory Institute plans to restore one billion acres (404 million hectares) of land by establishing 100 holistic agricultural hubs worldwide, 40 of which will be in Africa.“What I have to share are a few profound principles that can make a huge difference to people’s lives, can yield 300% more profit than conventional approaches, and can provide an anchor for our planet in these times of climate change,” explains Allan. Allan is convinced that, with greatly increased livestock numbers and holistic planned grazing, even deserts such as the Sahara in Africa or the Tihama in Yemen can be transformed. In the campaign to halt desertification, scientists have been advising governments to stop nomadic pastoralism. Allan cites the example of the shooting of 50 000 Navaho sheep by the US government because of the belief that they were causing desertification. “After the livestock were removed the desertification got worse. The same happened in Africa after mass game culling programmes. The livestock and game were not the problem, the problem was that there wasn’t sufficient animal impact and hoof action, and the animals were too sedentary,” he explains. “Early Scottish shepherds understood this and spoke of the ‘golden hoof of the sheep’. “Early South African writers, observed and described the thundering hooves of migrating animals, healthy grasslands and reedbeds. That land with the same rainfall is now arid and desertifying. We need to hammer the land with mass hoof action; we need to stimulate litter build-up, which slows down water and soil run-off, evaporation and wind erosion. This encourages plant growth and increases plant cover. The seed stores are all there, waiting for the right environment to germinate, but they cannot germinate in compacted, capped soil,” says Allan. Many farmers believe that burning stimulates plant growth, but Allan points out the damage this causes. “Africa is burning more than 2 billion acres (809 million hectares)of grasslands a year, the immense carbon emission significantly contributing to climate change and destroying the soil. Soil is a living organism like skin, if you burn too much of it, it dies,” he says. A fine example of what can be achieved with effective rainfall and the hoof action of cattle and game is to be found on the 2 630ha Dimbangombe Ranch in the Hwange communal lands near Victoria Falls, Zimbabwe, which has an annual but erratic rainfall of 600mm. The Africa Centre for Holistic Management, of which Allan is chairperson, manages the land in partnership with local chiefs. “Ten years ago the veld was in a bad state. The best areas had been 90% bare for about 30 years because of continuous grazing and frequent burning,” recalls Allan. Increasing livestock numbers by 400% (to 500 cattle and some goats) and following a programme of holistic planned grazing, veld degradation has been reversed, dead soil has been transformed into a thriving grassland, and rivers, streams and pools that had dried up now flow again. The livestock graze as one large, undivided herd from dawn to sunset under the close supervision of full-time herders, who herd from the front to control the pace at which the animals move. The herd is never spread; it operates as a concentrated unit occupying less than a hectare at any given time, and moving constantly. 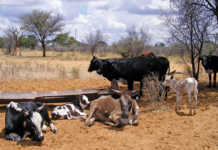 Because the cattle graze, unfenced, on the same land as wildlife, they are herded into portable kraals at night. “We achieve extremely high animal impact in the kraals and we use them for no more than seven consecutive nights to heal any seriously eroding gullies or extremely compacted bare soil,” Allan explains. Fixed-point photography over several years has monitored the dramatic reversal of desertification at these sites. He advises anyone planning to farm holistically to take the official stocking rate for the area as a general stocking guideline, but to begin by doubling the rate. The Holistic Alternative: A Guide to Cattle Farming in South Africa, by Andre Mentz.